YouTube is an amazing resource for an incredibly wide array of topics. You can learn everything from how to apply eye shadow to changing your car’s oil. In our case, you can learn a ton about FPV quadcopters! You can watch sweet freestyle FPV videos, learn from experienced hobbyists, and share your own videos. This article contains our collected list of recommended YouTube channels that we love and want to share with you. Let us know if we’ve left anything off of our list! Don’t forget to check out our own Propwashed YouTube video channel. We upload videos on a wide range of topics: everything from edited freestyle videos to in depth video guides. Similarly, if you are looking for fellow pilots to follow, be sure to check out out Five Favorites series! This series highlights our five favorite videos from the past month. Check out the playlist below! With that said, lets dive into some of our favorite channels! If you are in to freestyle or want to learn the latest in acro maneuvers, these are some channels you should check out. Jordan Temkin: A DRL champion who puts together stunning footage. You will find a mix of racing and freestyle videos on his channel. DiegoFPV: Smooth looping freestyle from a variety of locations in northern California. A great pilot that creates a mix of intense and relaxing freestyle. SilverStoneFPV: A great freestyle pilot we have featured many times on Five Favorites. Great footage in stunning mountain locations. Gab707: Creates some amazing cinematic videos. His mountain range videos paired with some stabilization edits make for some breathtaking footage. Charpu FPV. Maybe you’ve heard of him, maybe you haven’t, but you definitely will at some point. Charpu (Carlos Puertolas) is widely regarded as one of the earliest stars in the community. He gained a lot of popularity thanks to his insane trick videos and kind nature. He’s appeared in a couple Tested videos explaining the hobby and going through a miniquad build. Look to his channel to see great freestyle videos with great music accompanying his efforts. Skitzo FPV. Skitzo is constantly pushing the boundaries when it comes to FPV freestyle. Whether it’s playing with camera angles, pushing the limits of flying, or interacting with the environment in innovative ways, you’ll see his influence in community videos everywhere. Skitzo’s video No Boundaries is one of his most popular videos and really exemplifies his creativity while the video Uninhibited puts his insane flying skills on display. High recommend Skitzo’s channel for sweet, creative videos with some really great twitch piloting. mattystuntz. mattystuntz is a very innovative freestyle pilot. His channel originally started as a video for him to share his music, but has now evolved into a place for him to share insane FPV freestyle videos. It’s not often you watch a video and forget about gravity. For a single person putting out his own content, mattystuntz is very technical and shows really great innovative freestyle maneuvers. Look to mattystuntz’s videos for amazing loops flight lines you might not have ever thought possible. FinalGlideAUS. Similar to our own Novuh, FinalGlideAUS (Chad Nowak) is both a full scale pilot and has been involved in the RC aircraft hobby for a very long time. His years of experience and passion shine through in his videos. You’ll find more than just FPV Racing Quadcopters on his channel, but it’s still great to learn and watch from someone with so much experience. He tends to be very high energy and his flying matches his personality. FinalGlideAUS shares awesome event coverage mixed with FPV flying to videos where you get to learn more from his knowledge and wisdom. Mr Steele. Mr Steele brings his sharp wit and sarcastic commentary wrapped around his warm personality to his videos and commentary. You know he has deep knowledge and enjoys sharing that information. Mr Steele’s video range from awesome freestyle videos to detailed technical/reivew videos to musical talent. Le drib: A fantastic pilot that has put a big emphasis on vlog style content. Check out his channel for the “FPV lifestyle” type content, fancy flying, and general quadcopter goodness. Vek FPV: Host of one of the most popular FPV livestream/podcasts, Vek puts out a ton of interesting content. Whether you are interested in great flying or hearing interviews with some of the best in the community, this is definitely a channel to subscribe to! These are channels we think everyone interested in the hobby should be subscribed to. Like TV, they are segmented into episodes and cover a broad range of topics from within the hobby. Rotor Riot. Rotor Riot is comprised of a solid who’s who of the FPV Racing community. Rotor Riot puts together a wide range of videos from interviewing manufacturers, wild video ideas, and community videos. They have a great team behind them producing interesting and polished videos. Showmewhatyougot. The Showmewhatyougot crew is made up of a talented group of racing-centric pilots. Most of the team has been featured in DRL’s TV series and are mainstays on multiple racing circuits. They put out a constant stream of awesome content, including build videos, racing content, and more. These are the channels you should consider subscribing to if you are getting into the hobby and want to learn how to build your quadcopter. They are also great channels to follow if you are into the technical aspects of the hobby or want to know about new products on the market. Flite Test. Flite Test technically does more than just FPV Racing videos, but they provide video content that’s a mix between Mythbusters and How Does It Work? The majority of their videos focus on hobby RC crafts with some quadcopter related material in as well. Expect to learn about the various aspects of RC crafts as well as be entertained by the crazy vehicles they put together. You can’t deny that the people behind Flite Test love what they do, it definitely shows. Great for increasing your knowledge in a fun and enjoyable way. Joshua Bardwell. Joshua’s channel started out as a great resource to learn the ins-and-outs of PID tuning using Blackbox. Lately he’s been branching out and adding articles comparing the performance of various miniquad components with each other as well. We definitely recommend checking this channel out if you are interested in learning to tune your quad. Painless360. Another great channel with great production quality demonstrating “how to” do all sorts of things from programming your transmitter to building your quad. Recommended for anyone getting into the hobby. RCModelReviews. A channel run by Bruce Simpson, a retired electronics engineer flying out of New Zealand. He has some great, unbiased insight on the electronics we use in the hobby and has a seemingly endless supply of products to try out. You will definitely learn a lot about the inner workings of how all RC aircraft work from his channel. rctestflight. 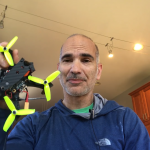 rctestflight is certainly more than just FPV Racing, but he provides valuable videos for FPC racers as well as the RC community as a whole. Whether he’s trying new ideas, like flying a miniquad while in a moving car, or explaining and detailing a product, his videos are comprehensive and interesting to watch. You are bound to learn something from his videos that you might not have expected. UAVFutures. Stew at UAVFutures has a great channel with a lot of informative build logs and reviews. He also has a ton of tutorials on a wide range of topics. We recommend this channel to anyone getting into the hobby. Investors and companies are making the bet that Drone Racing could be the next big spectator sport. They have been pouring money into organizations that hosts fantastic races, and most of the resulting video content has gone onto YouTube. These are the channels you should pay attention to if you are interested in the spectator-sport variety of Drone Racing. Drone Racing League. The Drone Racing League produced some really high production promotional videos that got the Internet buzzing. With some serious financial backing and investment, the DRL is looking to make drone racing a real feature event. They’ve pulled in some very notable pilots from around the country to put their skills to the test. World Drone Prix. The World Drone Prix came onto the scene in fashion when they announced a prize pool of $1 million dollars. Huge news as it really started to legitimatize FPV Racing as a competitive event. After the DRL came out, the WDP released their videos and shared what they were creating. The WDP brought huge press as their first event was held in Dubai and gathered together all of the top pilots in the entire world. Look forward to seeing more events and races held in the future. MultiGP. A growing racing community and league. Their event management system is also used in many races for competitive ranking and tracking.